MAC | Studio Fix Powder Foundation: This is my longest running favorite foundation! Actually, this is the first foundation that I ever wore on a regular basis. For day-to-day/everyday wear, I prefer the ease of dusting a light layer of powder foundation. The coverage of this powder is just amazing. Just an easy and light dusting really perfects my skin and leaves me looking flawless. NC15 is a perfect match for me in this foundation. I am never without this. As soon as I run out, I always buy more. Also, sometimes I layer this over a lighter coverage liquid foundation to increase coverage. Love, love, love this! Laura Mercier | Silk Creme Moisturizing Foundation: This foundation has the most beautiful feel! I adore everything about it and reach for it often. This foundation comes in both moisturizing and oil-free formulations. It Cosmetics | Celebration Foundation: This is a fabulous powder foundation! It is packed with anti-aging ingedients. So, like all IT Cosmetics products, it is good for your skin while giving you a flawless finish! While it is a powder, it has a luxurious creamy feel and fabulous luminous coverage. COVERGIRL | Ready, Set, Gorgeous Foundation: The Classic Ivory shade is a pretty good match for me in the Summer when my complexion is slightly darker. While I do wish this was slightly lighter, I still love the look, feel, and coverage of this foundation. Plus, the price is great! Urban Decay | Naked Skin Weightless Ultra Definition Liquid Makeup: Like the name states, this foundation feels weightless on your skin. This foundation honestly looks like "real skin"...but better! It is so natural, so light, and so flawless while still giving good coverage. Plus the shade 0.5 Cool/Very Fair is a perfect match for me. Shiseido | UV Protective Stick Foundation: This stick foundation from Shiseido is phenomenal! It is water-resistant and it contains SPF. So, it is a perfect Summer foundation for me. The shade Fair Ivory is a decent match for my skin tone (just slightly too dark...but, it works in the Summer when I am slightly darker and self-tanning). This glides on smoothly and it is a perfect small size for your purse for touch-ups! Lancome | Teint Visionaire Skin Correcting Makeup Duo: I love this 2-in-1 from Lancome! It has a liquid foundation on the bottom that is packed with anti-aging ingredients (contains the active ingredient as Lancome's Visonaire Serum!!!) as well as light-refecting skin enhancers. The top flips up to reveal a creamy concealer. This is a great idea! I use the liquid all over and then use the concealer to give more coverage where I need it on my face. I love how my skin looks with this: flawless with a dewy glow. Beautiful! I wear shade #100 Ivoire. tarte | Amazonian Clay Full Coverage Airbrush Foundation: As much as I have grown to love liquid formula foundations, I admit that for "easy makeup" days, I always reach for a powder formula. This is so fast and easy to apply. It has all good ingredients in it, too. I like the natural finish (not totally matte). You can build coverage from light-full depending on how you apply. I apply it with tarte's brush and it looks flaweless. Plus, this really lasts all day! I wear the shade fair-light neutral. NARS | Sheer Glow Foundation: This hydrating and luminous formula leaves my skin looking so perfected while feeling so light on my skin. The shade match of Siberia is spot on to my skintone in the Winter. So, this is a perfect foundation for right now! Love, love, love it! IT Cosmetics Celebration Foundation is a MUST HAVE! It's my out the door in 5 necessity! 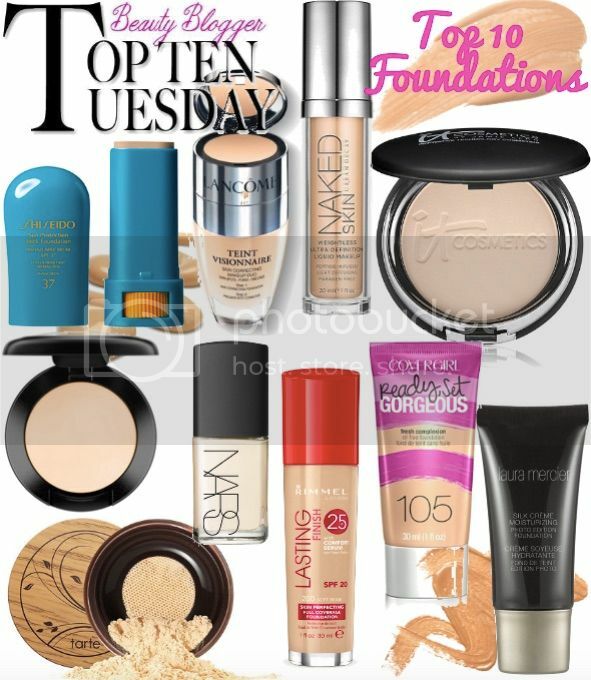 SO many great foundations! I used MAC Studio Fix (it was my holy grail) for years! Lots of great choices! I haven't tried the Tarte foundation and that looks interesting! I think you've got great choices. Even though I own the UD Naked Skin the color might not be the best I've picked. I agree on the Rimmel, it amazes me. Two of my favorite foundations at the moment are the MAC Waterweight foundation and the Bobbi Brown Intensive Skin Serum foundation. The UD is such a great foundation.